Our professional RNs have met the licensing requirements mandated by the NY State Board of Nursing, and are able to perform a range of tasks, including wound dressing, injections, enemas, catheter assistance, hospice support, patient monitoring, and much more. Don’t hesitate to call Care 365 for professional nursing in your home following an illness, injury, or surgery. Our HHAs can perform a number of duties to assist with everyday activities, such as bathing, toileting, dressing, dressing changes, skin care, light cooking, medication scheduling, and more. If you’d like to learn more about having an aide come in to your home or your loved one’s home to help with daily chores and personal tasks, feel free to reach out to us by phone with your questions. We employ full-time therapists who are available to help with the process of recovering from illness and surgery. A therapist is more than just an NYC home health aide- they are trained and highly skilled in the use of intervention methods for the treatment of disorders and recovery and rehabilitation. If your doctor has recommended a therapist, call us with a referral, and we’ll match you with the right type of therapist for your needs. If you don’t qualify for government assistance or require more hours of care than your plan covers, we can provide affordable private pay care at home. 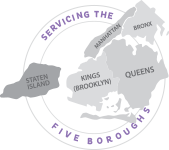 We believe we offer the most comprehensive program available in NYC, with options in skilled nursing, home health aides, companion care, on-call or hourly service, and 24-hour live-in care for you or your loved one. If you’re returning home after surgery or an illness and require long term or temporary assistance, Care 365 is the most affordable alternative to nursing home care. If you’re eligible for the CDPAP program, you can choose any caregiver for your in-home health care- including a family member, a trusted friend, or someone you have hired in the past. Being cared for by someone you are comfortable with can provide exceptional peace of mind. Call us to determine the level of care you’re eligible for. If you qualify for CDPAP and your chosen caregiver is at least 18 years of age, all costs may be covered by the program. You’ll need a referral when you call Care 365, but don’t worry- the process is simple and we can take care of the work involved. Get connected with an NYC home health aide from Care 365 just by making a phone call to our office- we’ll do the rest.